Peter Brown and Patrick Adams: two names as likely to create frenzy on the dance floor as an eBay auction are the P's of P&P Records. The P&P story started in the mid-sixties with Peter Brown leaving his rural home in Georgia for the hustle and bustle of Harlem NYC. It was not long before Peter met up with Patrick and their historic run onto the charts and dance floors began. Together Peter and Patrick put out a seemingly endless string of records on imprints such as P&P Records, Queen Constance, Golden Flamingo, Heavenly Star, Sound of New York, Hit Makers, PAP, Sound of the Universe etc. etc. etc. The LP edition (on HOT PINK vinyl) features cuts selected by DJ Spinna for the insane continuous mix found on the CD version. 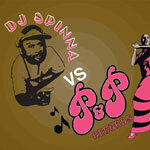 Here you'll find Spinna's P&P favorites in their entirety. Many of the cuts are long out of print and hard to find. Some go for 100s in eBay auctions and from rare vinyl dealers. DJ Spinna vs. P&P the LP Edition offers you these highly sought after aural masterpieces from the P&P catalog on a new, pristine vinyl pressing...all hand selected by a DJ/producer who understands the very soul of New York City.